From Norway I had to make a quick ride towards London to get me and the bike on a plane to North America. The final leg of my journey was in front of me, and it began with a ferry ride across the sea to Denmark. 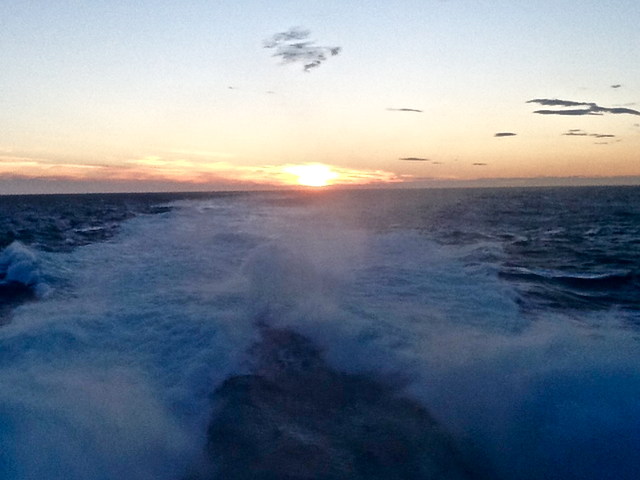 Riding away from a beautiful Norwegian sunset delivered us into Hirtshals, Denmark. Arriving in the middle of the night, the only knowledge of the surrounding area was from my map. The top priority was finding food and gas since all I had was a can of corn, an empty water bottle, and a motorcycle down to its last drop of fuel. After riding around searching for an open gas station an angel came strolling by to save me, or really just a drunk Danish guy. He explained in amazing detail where I could find myself some petrol and grub. Me and the bike both got filled up, and gas station food never tasted so good. The map showed a long beach surrounded by green-space to the east so I made my way there for a place to lay my head. At one in the morning I’m not too picky about the spot. It turned out pretty stellar though. I woke up next to a pretty beach just asking to be ridden on. I spent the morning exploring the hard packed sand, riding through flocks of seagulls, and watching kite-surfers. With a broken camera lens, the only pictures I was able to take for the final part of the trip was with my old IPad. A full day of riding got me most of the way down Denmark to the SW coast. A lovely night camping next to the North Sea on a farm. Crossing into northern Germany brought wind turbines as far as the eye could see and wide smooth autobahns with Mercedes, BMWs, and Audis flying by as if I was standing still. The density of humans began getting tighter and tighter so I did something I very rarely do. Pay for camping. It couldn’t have been more than the second or third time for the entire journey, but after a few long days on the road with no shower or complete peace of mind, I gave in. The last thing I felt like doing was staying in the wrong farmers forest and waking up to a pitchfork in my face. The next day I only had a short ride southwest to Cologne, Germany, to stay with a friend. Unfortunately, the motorcycle always calls the shots on how the day will go and it decided to throw me a curve-ball. About 20km into the day along the autobahn, as the rain began to come down with some force, my bike died. The same feeling as when it runs out of gas, but unfortunately that wasn’t it. My electronics went out. One of the most frustrating things to go wrong with a bike is the electrical system. Sometimes it takes a lot of digging, trial and error, and patience to find the culprit. Luckily I was able to coast to a stop under an overpass where I was covered until the sun came back out. It was a little nerve-wracking working on the shoulder next to vehicles zipping by me at high speeds. A little while in, a police van pulled up behind me and my first response was thinking that they were gonna be upset I was on the shoulder of the autobahn, but they were extremely friendly. After making sure I didn’t need any help, they stayed behind and put on flashing lights to give me some protection. It feels nice when the police help you out like that. After tearing half the bike apart, I knew something in the system was blowing my main fuse. Each time I’d turn the key, the new one would blow. Fortunately, I had a lot of them or I would have been screwed. One of those little things that I never needed for almost 50,000km, but was very happy to have at the end. After blowing four of them, I tracked it to the dash. After disconnecting the main plug into the dash (speedo, RPM, temp. ), the fuse didn’t pop and I was back on my way. The rest of the trip had to be done without these valuable instruments. From Cologne, I entered eastern Belgium. The final wild camping spot of the journey was one of the best. I found a picturesque lake that reminded me a bit of Plitvice N.P. in Croatia. I don’t know the name of it and don’t have any pictures, but will never forget it. Slipping by the sides of a few locked gates and following gravel/muddy tracks led me to the shores. A three-country day took me all the way through Belgium to the coast of France where I caught a ferry over to England from Calais. 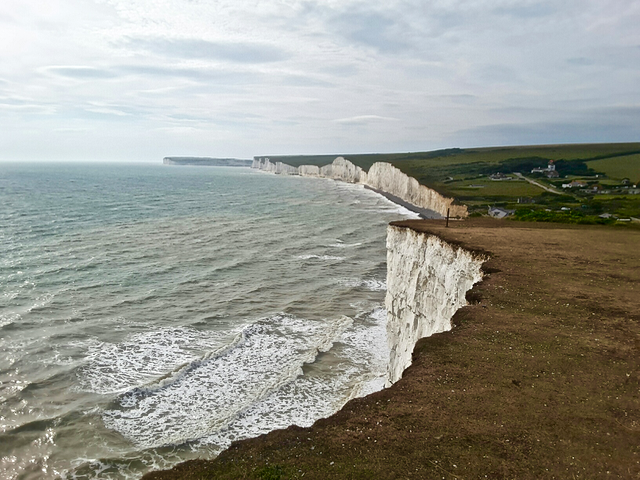 A boat across the English Channel landed me and the bike in Dover and the white cliffs of southern England. I spent a few days exploring the area. The Birling Gap coastline was spectacular with green meadows dropping down to pebbly beaches being beaten up by the English Channel. The high white cliffs are chalk white, and actually made of chalk. I kept a big chunk and wanted to take it home as a souvenir, but at the last second decided not to try and fly internationally with something that looked like a brick of cocaine. I had to declare everything on my motorcycle when shipping it, and it might have been a funny story to get taken aside when they thought I had a kilo of coke, but not worth the hassle. I also spent some time in Brighten, Shoreham-By-Sea, and the Surrey Hills area. I didn’t even have time to ride into London. Ireland, Scotland, and the rest of England would have to wait for another day. It was time to get in the sky and over to North America. Air Canada has a killer promo that they have been running in the summer the last two years. Usually to fly a motorcycle anywhere in the world you’re looking at over two thousand dollars easy. From May 1st till September 30th, they offer special prices for shipping between Europe and Canada. Brussels, Paris, Frankfurt, Dublin, and four different airports in England are an option. In Canada you can choose between Vancouver, Calgary, Toronto, and Montreal. Originally I was going to send it to Toronto at the end of September and ride across North America back home to Oregon, but circumstances led me needing to get home sooner and going all the way to Vancouver. I found the cheapest option to be from London. To fly to any of the Canadian destinations it’s a flat rate of 699 British Pounds, which is getting better and better with its value going down against the dollar. When I booked, it came out at just under $900, now a month and a half later it would only be $850 all the way to Vancouver, Canada. It wouldn’t have cost much less shipping on a freighter across the Atlantic Ocean to the eat coast, which takes around two weeks. Shipping it on a boat to Vancouver would have been more expensive than the flight. A great option if someone is looking to take their motorcycle from North America to Europe or vice versa. 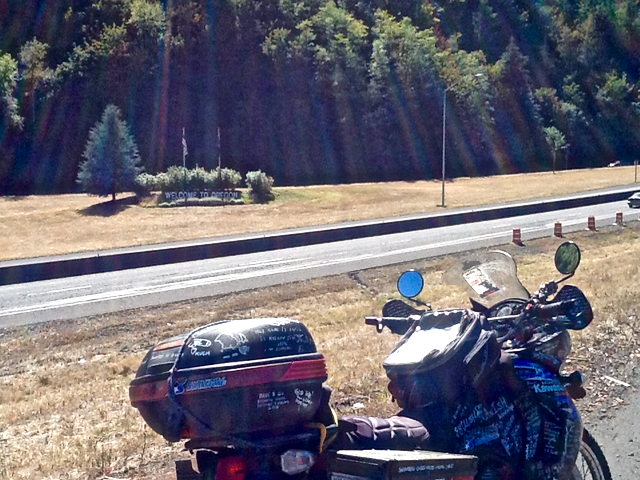 At the end of August me and the motorcycle flew from London Heathrow Airport to Vancouver, Canada. The whole process was simple, and easier than shipping it on a boat, like I did from Australia to Malaysia. A day or two before your departure date you bring the bike to Air Canada Cargo’s site at the airport and get the paperwork all filled out, complete the declaration form which lists everything traveling on the bike, give them some money, ride into the warehouse, and disconnect the battery. That is literally all you have to do. They strap it to a frame to be loaded and unloaded from the plane. I caught one break. It was the weekend and the dangerous goods inspectors had gone home. I needed to be there while they did the inspection and then sign the forms. The problem was, my personal flight was out of London Gatwick Airport, and the bike was from Heathrow. My flight was pretty early in the morning and there was no way I could make it back to meet with the inspectors and still make my flight. The guys running the counter were extremely helpful in every way and just overall really friendly. They had me sign all the blank forms, and hoped that would work out alright, which it did. It all went smoothly. Arriving into Vancouver late at night, I found a bench to grab some sleep. I caught a big break on the Canadian side too. Nobody had told me the only cargo that can be cleared by customs on the weekend was perishable goods. Being Sunday and my motorcycle not being made of bananas, I should have had to wait until Monday, but the Custom Officers did me a favor. Since I was there so early, and before they were starting into their days work, they decided to help me out. 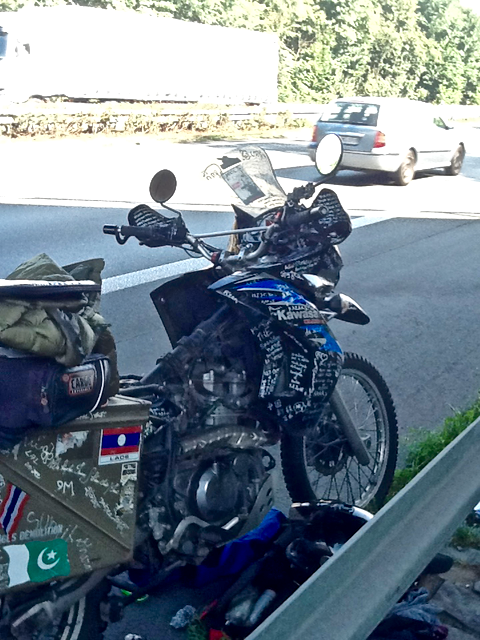 An officer drove all the way over to meet me and stamp all my paperwork, which would clear the motorcycle from customs. It only took a couple of minutes. They let me know how big of a favor they were doing for me since I was just trying to get home a short ways to the south. A great bunch at Air Canada Cargo gave me some help unpacking and a nice welcome back. That morning we were reunited and back on the road. A short ride took me to the U.S. border along beautiful Boundary Bay. The border officer was a bit perplexed by my story and looked over my passport for about 15 seconds. Without asking for any other documentation, he sent me on my way. Much easier than I had expected. On my way south, I made a few stops through Washington to see friends. Eventually, I crossed back into Oregon. After close to two years and 50,000km, I had finally reached home. Arriving home was a bitter-sweet moment. It felt amazing to have achieved what I had set out to do. Much of it not the way I had expected or planned for it to go, but somehow managed to wheel us into my parents driveway. Riding though Asia feels like a lifetime ago, but at the same time, like it was just last week. I can still taste the flavors, smell the aromas, see the faces like they’re with me, and feel the soft and hard ground that I called home all those nights. It feels like just yesterday I was sleeping in my van on an Australian beach and had the bolt of realization hit me that this needed to be a motorcycle adventure. Was it really two years ago that I was packing the bike up in the Sydney Port to send on its way to Malaysia all shiny and new looking. There were highs and lows, many of them. Riding through places that people told me were impossible or I couldn’t do it. Lying in a hospital bed in India with a mangled leg and my motorcycle lying in a small police compound half destroyed. All the memories, the good the bad, happy to sad, terrifying to exhilarating, beaten down to full of endless energy, and going through every emotion under the roof, led me back to my parents driveway. I wouldn’t change a single thing about the adventure, except maybe a little less rain and a little more sunshine throughout Europe. A good dose of melancholy hit me pretty hard. This journey had consumed me, and all of a sudden it was over. The next adventure will present itself eventually, but for now it’s starting to feel like the past one was just a dream or a book I read. If you’ve ever had a dream to go out and do an adventure like mine, just go. The hardest part is just deciding to do it. The rest just falls into place like dominos. Don’t let money stop you. If you have to work for a couple of years and save then so be it. It’s definitely possible to spend more and do it with a little more comfort, but it’s more fun to rough it. One of people’s first questions is about money and how it must have cost a fortune. I know guys that spent a lot more than me and maybe a couple who got by on less. I’ll write another post on that topic soon. For now, it’s good to be home and around family, but my feet are already getting extremely itchy to get moving again. 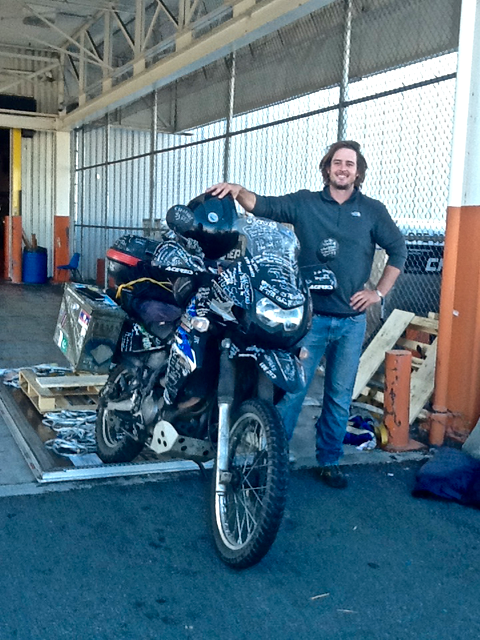 This entry was posted in adventure travel, border crossing, camping, Kawasaki KLR650, Motorcycle world travel, Photography, travel and tagged air canada, camping, denmark, dover, england, ferry, flight, germany, how to, motorcycle, route, shipping, white cliffs, world travel. Bookmark the permalink. Enjoyed your Ride Report! Good Luck with your father! Great post! Beautifully written. It is great to have you home again. Congrtulations mate on a job well done. It was nice to spend time together in Burma and India and i’m sure our paths will meet on two wheels again. Thank you for your blog about your adventures! I’ve truly enjoyed reading all the ones I’ve seen. What an experience! Good luck and happiness in whatever is in your future. Thanks for reading along and being part of the adventure Janet. Makes me me happy to know you enjoyed it.